First Biotech is advancing the art of site-directed mutagenesis to save time and efforts associated DNA mutagenesis of large plasmids. Our products circumvent the need for sub-cloning and target only the regions of interest for PCR. Thereby, increasing efficiency and reducing the probability of random mutations imparted by DNA polymerases. Mutant plasmids can now be created in a matter of days instead of weeks or months common with existing techniques. First Biotech’s mutagenesis kits are efficient for virtually all DNA plasmids up to 50,000 base pairs in size. Our products also simplify mutagenesis by expanding flexibility, allowing the user to perform multiple deletions, substitutions and/or insertions greater than 300 base pairs with unmatched speed and fidelity. The GenEdit™ kit is designed for maximum power to facilitate direct mutagenesis on plasmids of up to 50 kilo base pairs (kbp) without resorting to sub-cloning. This easy-to-use kit will produce significant savings in time, labor and cost over traditional DNA mutagenesis methods. Most clones obtained with GenEdit ™ procedure will contain only the mutation of interest since the user’s plasmid is not copied during the procedure by in vitro reactions. Under optimal conditions, it is possible to complete all biochemical reactions using the kit within 4-5 hours! 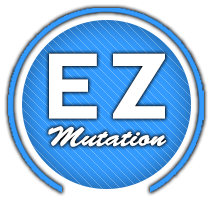 The EZ-Mutation™ site-directed DNA mutagenesis kit employs the simplest and fastest technology available to introduce a wide variety of mutations into small plasmids. It supports plasmids up to 12 kbp without the need for sub-cloning or the availability of unique restriction sites. This technology requires the amplification of the full target plasmid; therefore, we recommend it for plasmids smaller than 6.0 kbp.